The amount of waste created by central Ohio residents and businesses is staggering. In fact, every resident generates an average of 4 or 5 pounds of waste each day. With only so much landfill space available, it’s more important than ever that we reuse, recycle, compost or divert as much as we can. The City of Grove City wants to make proper recycling as easy as possible for you so we provide each resident with containers to place acceptable items in for recycling. Please place these containers at the curb on your recycling day under the same guidelines as your trash. If your recycling container becomes damaged, please contact Local Waste Services at 614-409-9375. You may also rent an additional rolling recycling cart. This charge is set up directly with our local waste hauler. Don’t just recycle. Recycle Right. It’s not only important to recycle. It’s important to Recycle Right. By recycling only materials that are accepted at the recycling facility, your recycling will make more of an impact. SWACO’s “RECYCLE RIGHT” campaign makes proper recycling easy by providing a comprehensive list of what should and shouldn’t go in the container. 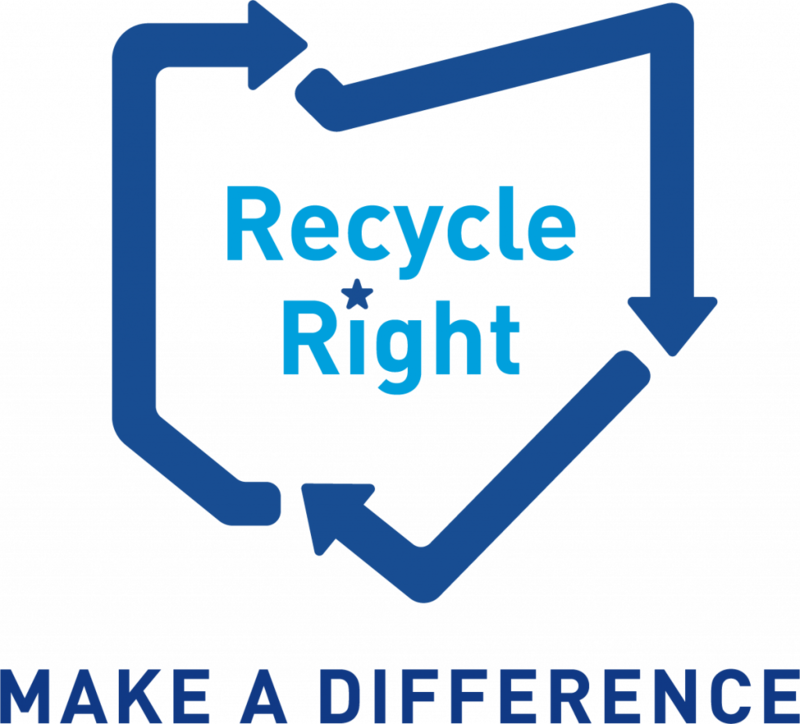 For more information about “RECYCLE RIGHT,” please visit the SWACO Recycle Right website. Have an Unwanted or Hard to Recycle Item? Visit SWACO’s Reuse and Recycling Search Tool website to find the best solution for your unwanted item. The City of Grove City currently contracts with Local Waste Services to provide weekly curbside collection of solid waste, recyclables and yard waste on the same day. Residents of Grove City and Jackson Township must use Local Waste Services for this collection. The service is billed quarterly, directly from Local Waste Services and can be started by calling 614-409-9375. Senior residents can take advantage of a discounted rate. Residents who are head of the household and at least 62 years old must register for a 10-percent discount with a valid identification showing birth date and proof of residency, e.g. utility bill, etc., call 614-409-9375 to register. To determine your collection day, download the Trash Collection Schedule/Map. Please have your trash, recyclables, and yard waste at the curb on your collection day by 7 a.m. but no earlier than 5 p.m. the day before your collection day. Within 24 hours, return such containers to the rear or other inconspicuous location on the lot, per Ordinance 725.07(a). Please follow the guidelines below when preparing your materials for proper collection. If materials are not properly prepared, the contracted hauler will not collect your material. During the holiday week, prior to your collection day (e.g. holiday on Monday and your collection day is Thursday), your collection is delayed one day. If your collection day falls before the holiday, your service day will remain the same. Friday collection will take place on Saturday. Multi-family living residents (apartments and condos) have their service provided by the property management company. Please contact the property manager to get accurate information regarding your service if you live in a multi-family complex. Local Waste Services observes the following holidays: New Year’s Day, Memorial Day, Independence Day, Labor Day, Thanksgiving and Christmas. If a holiday falls on or before your collection day (Monday-Friday), service is delayed for one day that week only. If the holiday falls on Saturday or Sunday, there will be no change to your regular, scheduled pick up. All trash must be placed in bags or approved containers. Residents are responsible for providing their own trash bags and containers. Each bag or container must weigh less than 50 pounds. A rolling trash cart may also be available for rent. This charge is set up directly with Local Waste Services, call 614-409-9375 for additional information. The following items should not be placed in the trash. Explosive items, radioactive waste and other materials that could be dangerous to the workers collecting your trash. Information about how to properly dispose of needles and “sharps” can be found on the Columbus Public Health website. Information about how to properly dispose of Household Hazardous Waste such as fluorescent light bulbs, lawn chemicals and old gasoline can be found on SWACO’s website. Information about how to properly dispose of Prescription Drugs can also be found at SWACO’s website. Furniture, carpeting, mattresses, box springs and other bulk items will be collected with the regular trash when placed at the curb. Any upholstered items (including mattresses and box springs) must be wrapped in plastic. To learn more about what is acceptable in your trash; and how to properly dispose of or recycle items that do not belong in the trash, please visit SWACO’s website. Yard waste should be placed at the curb on your normal yard waste collection day. Residents are responsible for providing their own yard waste bags or containers. “Yard Waste Only” stickers can be obtained in City Hall, 4035 Broadway or the Service Department, 3262 Ventura Blvd., to place on waste receptacles designated for yard waste. Each biodegradable bag, container or bundle must weigh less than 50 pounds. Do not place yard waste in plastic bags – use only biodegradable paper bags (available from hardware and grocery stores) or clearly marked rigid containers. Yard waste is accepted on normal trash days April through December. Yard waste should be placed in “brown yard waste only bags” or in containers labeled with the yellow “yard waste only” sticker; two stickers per container. The containers should weigh no more than 50 pounds. Accepted yard waste includes grass, bush and shrub cuttings, leaves, garden growth and vines. Tree limbs or branches 4′ in length and 2′ in diameter or less may be bundled with twine or string. Do not use plastic or wire to enclose yard waste; these materials cannot be processed. Please do not put dirt in bags or containers, Local Waste will not take this item. Yard waste bags may not be set out days before pickup. They can be put out the night before or the morning of your trash pickup. Residents are responsible for cleaning up the area if bags break due to weather issues or containers being too heavy. If you have questions about trash, recycling or yard waste to the Grove City Service Department at 614-277-1100. Only yard waste is permitted in yard waste bags and containers. Please do not place plastic bags, plastic straps, plastic pots, food waste, rocks or dirt into yard waste bags or containers. For additional information about diversion options like reuse, donation and recycling, please visit SWACO’s website.